Martyn Gleaden's Fitzmartyn Blog | The jaundiced thoughts and febrile rants of a reformed misanthrope. The jaundiced thoughts and febrile rants of a reformed misanthrope. This entry was posted in Life, the Universe, & Febrile Rants on Mon 11 Dec, 2017 by martyn. Just in case I’ve packed the car with shovel, blankets, hat, gloves, warm clothing, flask of hot coffee, food rations, torch, emergency flare, snow chains, and informed all the relevant authorities of my intended route and anticipated time of arrival. This entry was posted in Life, the Universe, & Febrile Rants on Mon 16 Oct, 2017 by martyn. What part of sitting in the car, with eyes firmly closed, headphones on, and listening to loud music says, “Please touch my shoulder through the open car window, and start a conversation with me, even though you’re a total stranger”? This has happened to me twice recently in Blandford where people have wanted to discuss such important topics as: ” You’re listening to music, aren’t you?”, and “You look comfortable”, or my particular favourite, “You looked liked you were asleep“! Closing the window doesn’t really work either as some people just tap on it to attract my attention and ask if I’m listening to music… Even when I answer that I’m listening to a self-help tape on how to deal with people who invade my personal space they don’t get the hint and bugger off. Why do manufacturers make bicycles which won’t fit on “standard” cycle racks, or conversely why do manufacturers make cycle racks that don’t fit some fairly common types of cycle? I’ve been told to “get on my bike” by one of the North Dorset Mental Health Team to get some exercise and had a fancy dual suspension mountain bike donated by my daughter, I just had to collect it from her house in Bournemouth, so after saving up my pennies I bought a brand-spanking new cycle rack and proudly strapped it on the car (that’s a lie. It actually took me nearly an hour of sweat and curses to get it to fit). After arriving at Bournemouth I applied cycle to rack – or it tried… No matter how I placed the bike on the rack I couldn’t get it to fit Even a loud exhortation to the god of cycle racks didn’t work and I was faced with either leaving the bike behind until a later date when I could return with tools to dismantle the bike so it will go in the car boot, riding the bike home (obviously out of the question for an overweight, chronically unfit slob), or giving up the idea of cycling for exercise. This entry was posted in Life, the Universe, & Febrile Rants on Thu 31 Aug, 2017 by martyn. This entry was posted in Life, the Universe, & Febrile Rants on Mon 1 May, 2017 by martyn. Damn! I decided to strip down the lamp to see if I could spot a problem, but nothing seemed wrong. Rather than throw it away I had a go at upgrading the cooling by remodelling the pitch of the fan, upping the voltage on the fan motor to make it run faster, and oiling all the bearings. The lamp has been running on and off, soak testing for a few hours now, and the bulb is behaving perfectly with a much cooler lamp now too! 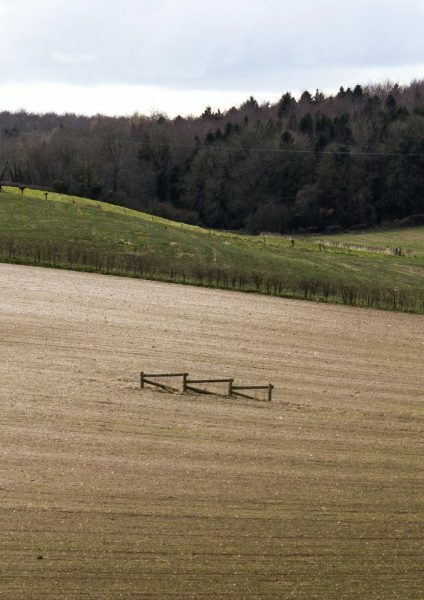 Every time I drive past this field at Bryanston near Blandford Forum I wonder about the three bits of fence sitting in the middle of the field. What are they for? Why were they erected, or left when the rest of the fence was disassembled? Can anyone put me out of my misery and give me the reason? This entry was posted in Life, the Universe, & Febrile Rants on Wed 12 Apr, 2017 by martyn. It’s nearly two years since I last made any rigs for sale but this morning, only a couple of days since I said I’d been tying rigs for myself, I got an email asking whether my range of rigs had changed and what the new prices were. Although it’s flattering that someone liked my rigs enough to keep hold of one of my catalogues for over two years I have to face reality and say that it’s uneconomical to buy my rigs these days as I no longer have my trade accounts and trade discounts on materials. After saying that, they were bespoke rigs tied with the best materials so they could command a slightly higher than normal price. This entry was posted in Life, the Universe, & Febrile Rants on Fri 6 Jan, 2017 by martyn. This entry was posted in Life, the Universe, & Febrile Rants on Fri 7 Oct, 2016 by martyn. Last Thursday Sue and I spent a whole day baking bread rolls for the Friday Lent Lunch at the village church. If you’ve never attended one it’s a mixture of sermon, fund-raiser and social event. You don’t have to be a believer to attend (just as well for me as I’m semi pagan/atheist) as it’s nice just to listen to a different belief every now and again. The lunch was a simple but substantial affair – Nettle Soup, Bread Rolls and fresh, clean Water…. The last bit was important as the lunch was a fund-raiser to install wells and clean water systems in Third World Countries. Monday we were back at the church for the weekly Coffee Morning and fund-raiser for the church restoration (our church is used as a village social centre rather than standing empty for days). Tuesday was a trip out of the village – to a neighbouring one for lunch! We have a village lunch club where some of the more senior and less mobile villagers are offered the chance to be whisked away for lunch in a decent pub. This week it was the Oak at Dewlish, a few miles away and purveyors of excellent food and local ales (and our local Cider “Rosies”, made just down the road from here 🙂 ). This entry was posted in Life, the Universe, & Febrile Rants on Fri 22 Apr, 2016 by martyn. When you live deep in the countryside your senses soon get acquainted with all all the sounds and scents of rural living. For instance two weeks ago we reveled in the sound of a machinery spraying the acrid, sinus-searing smell of pig muck for a couple of days. Today, as a build up to the magnificent symphony of Spring, we have the mechanical clacking noise of a muck-spreader and the sweet, warm scent of cow muck. This entry was posted in Life, the Universe, & Febrile Rants on Fri 4 Mar, 2016 by martyn. I can quote several more examples where I’ve sold really bad or ‘joke’ pieces and had to bring back home some works I class as good, so what is the problem. Is it me as an artist that has a skewed view on what is “good” or is the public so out of touch with what makes decent art? This entry was posted in Life, the Universe, & Febrile Rants on Sun 14 Feb, 2016 by martyn. This entry was posted in Life, the Universe, & Febrile Rants on Sun 31 Jan, 2016 by martyn. I confess to being a little confused by British law. In the Magistrate’s Court at Weymouth recently several people found guilty of assault by beating, theft, or criminal damage were punished by being given conditional discharges, community orders, and some had to pay expenses. At the same court Magistrates found a large group of offenders guilty and fined them on average £400 with £90 costs… Their heinous crime – not having a TV license! Yes Bowie is dead. So what? Yes I loved his music, yes he was a true artist, but I also love the work of other living and dead artists too, so one more dead artist isn’t going to make me break down into uncontrollable expressions of grief. He wasn’t a friend, I never met him except as one of thousands in an audience at one of his concerts so why should I be overly upset at his death? Maybe it’s the medications I take but I’ve never understood why people publicly express grief and sorrow over people who are merely public figures, not close family or friends. OK so someone you’ve seen on TV is dead, but is that a reason to go out littering a death scenes with bunches of flowers or fill social media with messages of sorrow? OK so I’m a barely functioning psychopath so not able to empathise with people, but even so simple logic dictates that you shouldn’t be affected by the death of a stranger. Thousands and thousands of people die every day, from starving babies to blown apart war victims, but I never see mass outpourings of grief for dead Tibetan monks illegally executed by the Chinese Authorities or dead children shot like rats in Brazilian slums…. Yes Bowie is dead. The world of art may be poorer for it, but I won’t grieve! This entry was posted in Life, the Universe, & Febrile Rants on Tue 12 Jan, 2016 by martyn. Christmas cheer was not in evidence as people drove round and round in circles looking for a parking space and then fought their way through the gales and driving rain to stand in soggy queues outside shops or shove their way around supermarkets with overloaded shopping trolleys. 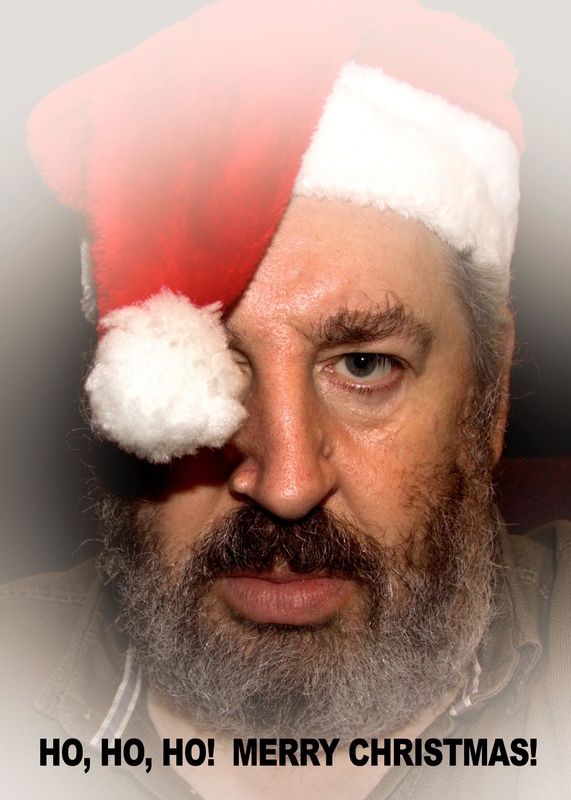 This entry was posted in Life, the Universe, & Febrile Rants on Thu 24 Dec, 2015 by martyn. Why? If I am prepared to believe in Father Christmas and pay a vast amount of money for a quick lap sit and a cheap toy then why deny me? This entry was posted in Life, the Universe, & Febrile Rants on Mon 7 Dec, 2015 by martyn. This entry was posted in Life, the Universe, & Febrile Rants on Fri 4 Dec, 2015 by martyn. This morning I had twelve items of post and only one was non-junk (and that was from HM Revenue & Customs so slightly junkish – a tax summary and a nicely coloured chart showing me how the government had spent it!). This entry was posted in Life, the Universe, & Febrile Rants on Tue 17 Nov, 2015 by martyn. 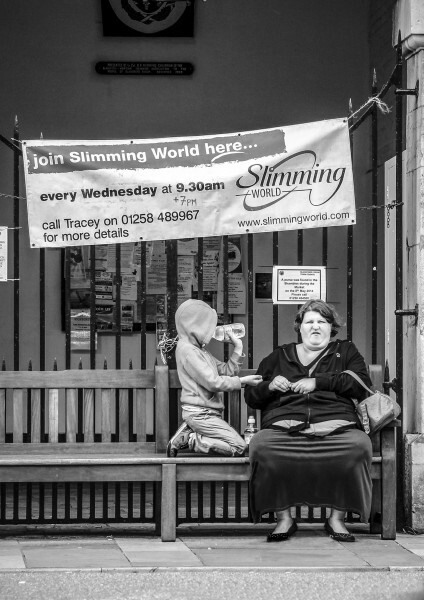 I’m rarely without a camera and enjoy the situations which street photography allows me to capture. Take this image for example; the juxtaposition between the banner and the woman can be viewed in several ways, my original reason was humour – but as I look more and more at the image I get pathos, sadness and maybe even despair. P.S. Yes I did ask permission of the model before taking this photograph. This entry was posted in Life, the Universe, & Febrile Rants on Sat 14 Nov, 2015 by martyn. Naturally Careful or Camera Careful? Now here’s an interesting topic; I’ve just been playing back the videos from my in-car video camera and either I’m a totally careful and considerate driver, or I’m conscious of the fact that my driving is being recorded so I’m being more considerate that normal. I suspect it’s the “old fart mode” kicking in as it’s years since I got a speeding ticket, I’ve even got a clean licence and that’s something I never had until a few years ago. This entry was posted in Life, the Universe, & Febrile Rants on Sat 7 Nov, 2015 by martyn. I’ve two excellent bottles of Vintage Port to drink and my Chiropodist daughter has just told me that my sore foot is actually GOUT! After a few ‘near misses’ by idiot drivers I’ve decided I need more protection for insurance claims than other drivers’ honesty. This entry was posted in Life, the Universe, & Febrile Rants on Fri 30 Oct, 2015 by martyn. After another trip to the doctor’s I’ve got arms like pincushions from all the blood tests, I rattle from the amount of pills I have to take, and I’m still dying slowly. All this preventative medicine they subject me to wouldn’t be so bad if it led to something, preferably youthful rejuvenation, but instead all it’s giving me is bruises on my arms making me look like an aging heroin addict who’s mainlining, and joy of joys, a warning that this latest pill I’ve been prescribed to boost my blood iron levels will make me feel sick and turn my stools black! Hedge – you will be neatly trimmed !!! This entry was posted in Life, the Universe, & Febrile Rants on Sun 18 Oct, 2015 by martyn. As part of a general “empty the shed and tidy the garden” campaign I’ve hired a waste skip – 4 cubic yards of gloriously empty space ready for filling up. Within minutes of the skip being delivered it had attracted a small crowd of men all anxious to share the glory of owning a skip. Forget sports cars – a skip commands much more interest; “how big is it”, “how long have you got it for”, “where did you hire it from”, but nobody daring to ask the un-askable question… “can I put something in your skip”? Eventually, as I started to fill the skip, people drifted away but not before giving assurances that they too would be hiring skips in the not too distant future. This entry was posted in Life, the Universe, & Febrile Rants on Sat 17 Oct, 2015 by martyn. As a result, especially in Dorset where almost half the drivers are foreign tourists and the other half are in their dotage, I’ve had to develop a “sixth sense” about the direction other cars may be turning at junctions. So imagine my shock today when, driving back from Blandford, a BMW actually stopped at a roundabout, indicated, and gave way to oncoming traffic…. This entry was posted in Life, the Universe, & Febrile Rants on Wed 16 Sep, 2015 by martyn. Tractors Good – Caravans Bad !!! It’s the time of year when this part of Dorset grinds to a standstill from surplus traffic. I know tourists are essential to the local economy, but so is agriculture. Queues forming behind slow-moving tractors and trailers are perfectly normal this time of year and farmers try to pull into lay-bys where possible to allow the queuing traffic to pass – not so with bloody caravans! Normally I don’t take to the roads much during August but whilst Sue has been in hospital I’ve had to make regular runs to Dorchester every day. A drive which normally takes me only 20 minutes is now taking about an hour of waiting in queues, not being able to see if the traffic is moving at all because I’m usually behind a bloody caravan blocking out all my view of the road ahead. If I’m lucky enough to overtake one on the dual-carriageway bit of the A35 there usually a convoy of caravans, mobile homes, and cars festooned in cycles and roof boxes over the hill, all heading lemming-like for the sea, and all creating an impossible to pass blockade. This entry was posted in Life, the Universe, & Febrile Rants on Mon 24 Aug, 2015 by martyn. This entry was posted in Life, the Universe, & Febrile Rants on Tue 9 Jun, 2015 by martyn. “Exercise is good for you”? As a reversal of my earlier post – which idiot said “Exercise is good for you”? I’ve been exercising today doing the gardening and I kept having sweats, hot flushes, aching muscles and joints, raised temperature, increased breathing rate, etc which only went away when I sat down to rest. This entry was posted in Life, the Universe, & Febrile Rants on Sat 11 Apr, 2015 by martyn. Not all dead people were saints! I feel like a rant – Why don’t nasty people die? I’m forever reading about how this person or that person who’s just died was a really wonderful, loving person. Why were they never mean, nasty buggers that deserved to die? Just once I’d like people and newspapers to be honest – not all dead people were saints, some of them were real villains and the world is a better place without them! This entry was posted in Life, the Universe, & Febrile Rants on Thu 9 Apr, 2015 by martyn. An exciting parcel came in the post today – a brand spanking new #4 weight fly rod from one of my many admirers. Actually it was a competition prize, but it’s more or less the same thing – somebody loved me enough to send me a new rod. This entry was posted in Life, the Universe, & Febrile Rants on Tue 7 Apr, 2015 by martyn. Who says exercise doesn’t do you good? I’ve just come back from the mental health unit with yet another prescription and short period appointment date 🙁 I think it’s because I complained about the horrible muzak playing in the waiting room which they say has been especially selected to calm people. I don’t notice the birdsong around here any more as it’s a constant accompaniment to my life, I only notice it’s absence, such as when a hawk is overhead. However there is one bird I hear which gives me more joy than any other; no not the Sparrows nesting above my window, though I do dearly love them – no the bird sound which brings me the most joy is that of the Woodpecker echoing around the garden. Damn arthritis!!! My bloody shoulder has been giving me hell the last few days and it’s not even the one I broke 🙁 Despite filling myself with port and painkillers it woke me at 4:00am and I haven’t been able to get comfortable since. This entry was posted in Life, the Universe, & Febrile Rants on Mon 6 Apr, 2015 by martyn. OK so I haven’t been feeling all that well, both physically and mentally, and it could have been reflected in my work output, but I’ve been weaving on both the looms and making some progress. This entry was posted in Life, the Universe, & Febrile Rants on Sun 11 Jan, 2015 by martyn. I finally got a warp threaded on the floor loom yesterday so have started a bit of huck lace on it. This entry was posted in Life, the Universe, & Febrile Rants on Wed 7 Jan, 2015 by martyn. So should I do a review of my 2014 or not? (incidentally my old English teacher told me never to start a sentence with either “and, so, or but”). This entry was posted in Life, the Universe, & Febrile Rants on Mon 5 Jan, 2015 by martyn. This entry was posted in Life, the Universe, & Febrile Rants on Fri 2 Jan, 2015 by martyn. As Sue has her elbow op in a couple of days and we’ll be more or less ‘grounded’ for a while, I thought I blow some of my Xmas pocket money on yarn so that I’ve something to keep me occupied whilst she recuperates. This entry was posted in Life, the Universe, & Febrile Rants on Sat 27 Dec, 2014 by martyn. This entry was posted in Life, the Universe, & Febrile Rants on Fri 26 Dec, 2014 by martyn. This entry was posted in Life, the Universe, & Febrile Rants on Wed 24 Dec, 2014 by martyn. Hurrah! Lucifer the Loom lives again When I got the loom I was given two lead weights, which I assumed were those used by weavers to add tension to any loose warp threads. This entry was posted in Life, the Universe, & Febrile Rants on Tue 23 Dec, 2014 by martyn. It’s a day full of strange new sensations and I’m not 100% sure if I’m comfortable with them 🙁 The reason? Sue has bought me some new undies! Why she decided I needed a change of style I’m not sure, and she has a different idea of male anatomy support to me, but I’ll give them a fair try. But the acid test will be a curry dayafter 😉 Will they cope with the chemical-laden gales? This entry was posted in Life, the Universe, & Febrile Rants on Mon 22 Dec, 2014 by martyn. I forgot to mention that, yesterday we went to have a look at the occasional exhibition by the Bryanston School teachers in Valentine Gallery, Blandford. Once again there were some really nice pieces, a few of which I could have happily seen on my walls. A range of styles and techniques kept us interested, especially a couple of intriguing Oils which neither Sue or I could agree how exactly they were created. Best wishes for an environmentally conscious, socially responsible, low stress, non-addictive, gender neutral, winter solstice holiday, practised within the most joyous traditions of the religious persuasion of your choice, but with respect for the religious persuasion of others who choose to practise their own religion as well as those who choose not to practise a religion at all. Additionally, a fiscally successful, personally fulfilling, and medically uncomplicated recognition of the generally accepted calendar year 2015, but not without due respect for the calendars of choice of other cultures whose contributions have helped make our society great, without regard to the race, creed, colour, religious, or sexual preferences of the wishes. This entry was posted in Life, the Universe, & Febrile Rants on Sun 21 Dec, 2014 by martyn.